Abell 74 is a large, ancient planetary nebula in Vulpecula at RA 21h 16m 52s and DEC +24d 08m 05s. It is also designated at PK 72.7-17.1. The object is mostly circular with an apparent diameter of 13.5′ although it appears to have additional structure extending N-S to perhaps 15′. North is to the lower right. It has a white dwarf central star (WD 2114+239) with an effective temperature of 108,000 K. Distance measurements for planetary nebula have a wide variance. The distance provided for Abell 74 is ~ 2,500 light years. It is very faint, and much stronger in H-a than OIII. It is classified by Tweedy and Kwitter (1996ApJS,107..255T) as a Type F that appears to be uniformly filled, and with an OIII zone present that is considerably smaller than the H-a. Abell 74 is interacting with the interstellar medium (ISM). My image contains a total 14.5 hours of exposures taken over several nights. The high contrast from very narrow (3 nm) H-alpha and OIII filters was utilized to bring out structure in this faint PN. H-a was mapped to red/magenta and OIII was mapped to blue-green (teal) to represent the color we would see if this object were bright enough to activate the cone sensors in our eyes. 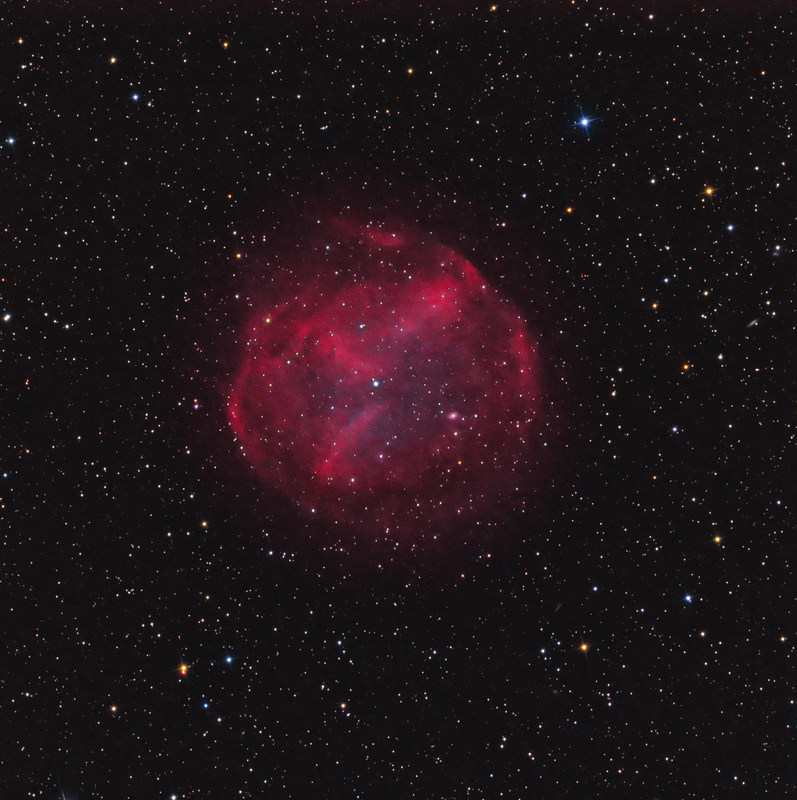 1 hour of RGB data were included for star colors using a G2V (sunlike star) white point balance.